Please note: This documentation is for Rejoiner legacy clients only. 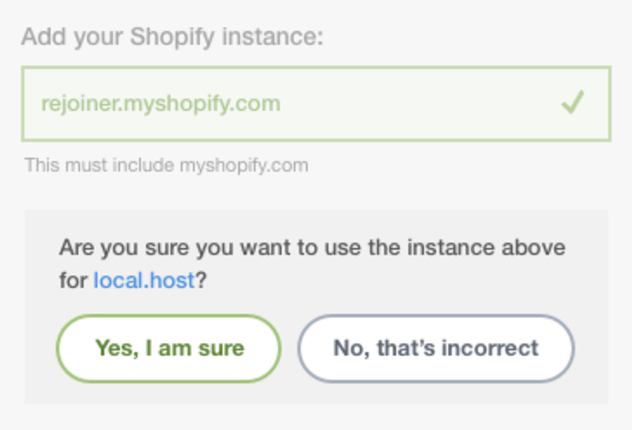 In order to connect Rejoiner to your Shopify store, you must first know your store's Shopify Instance and have a Rejoiner account. If you do not have an account with Rejoiner you will need to book a demo to get started. You will need to connect your eCommerce within your Rejoiner account. Follow the steps below to start connecting Rejoiner to your store directly from your Rejoiner account. 1. 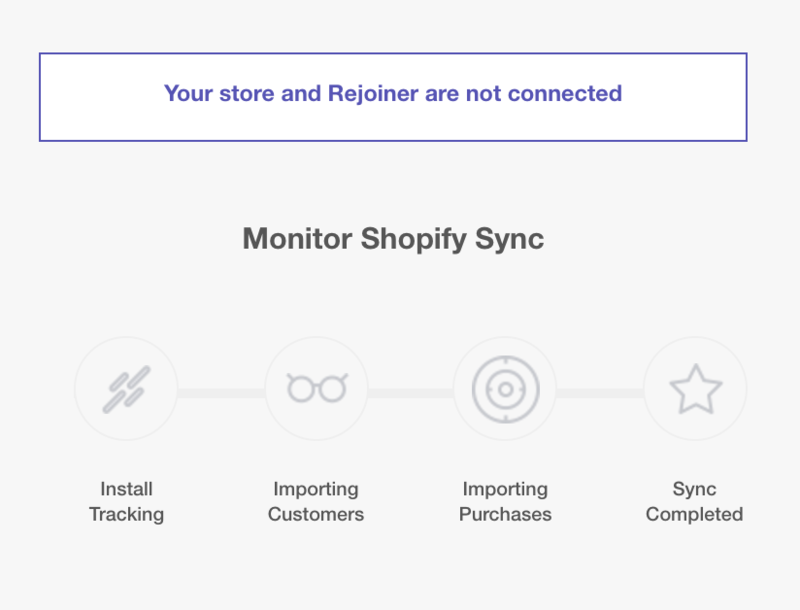 Sign into your Rejoiner account and visit the Shopify Connection screen. 3. Verify that you are connecting the correct Rejoiner account to the correct Shopify instance. 4. Next, you'll select data import options that best suit how you want to connect to Rejoiner . We recommend importing your 'Accept Marketing' list and at least 6 months of purchase data. You can learn more about Importing Customers, as well as Importing Purchase Data. 5. 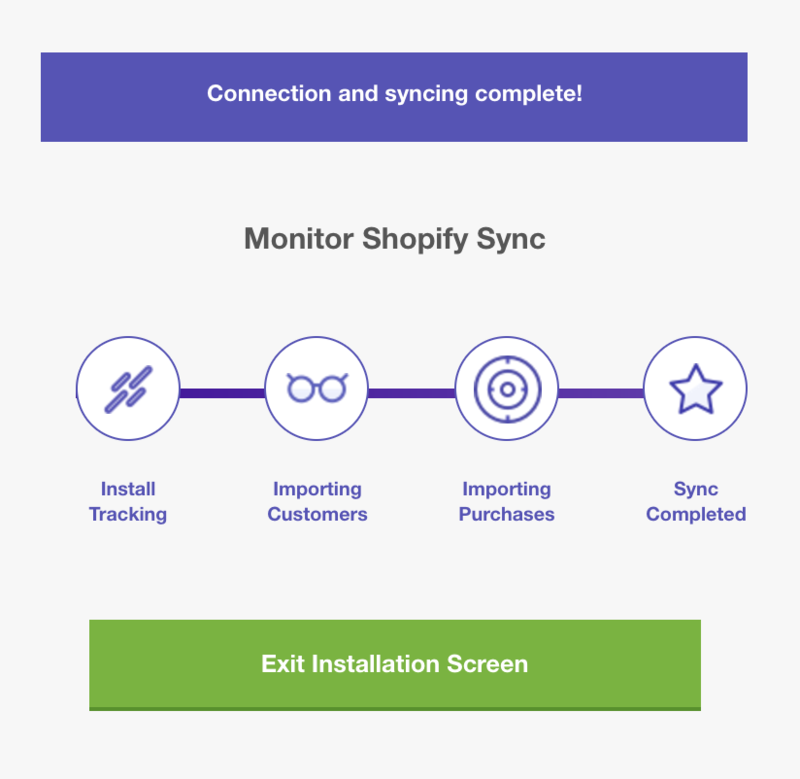 Next, click on "Connect Rejoiner to Shopify" to begin the connection process. 6. You will now be pushed to your Shopify Store to install the Rejoiner Shopify app. 7. After you click "Install app" , you will be redirected back to Rejoiner where on the right side of your screen you'll see a progress indicator. 8. Once the integration is completed, you can go ahead and click on "Exit Installation Screen". That's it! Congratulations. You're ready to start creating amazing lifecycle campaigns with Rejoiner. During the checkout process, customers have the ability to opt into or out of future marketing communications. Customers who choose to receive marketing will be added to the Accepts Marketing group, and you can email them with store updates, newsletters, and promotions. Not only will we create and import a list of those customers who accept marketing, but we will also keep it up to date so you can rest assured that Rejoiner only emails thoe customers who have opted in. How can I apply this list to my campaigns? You can use our segment builder to apply this list to any campaign in your Rejoiner account. 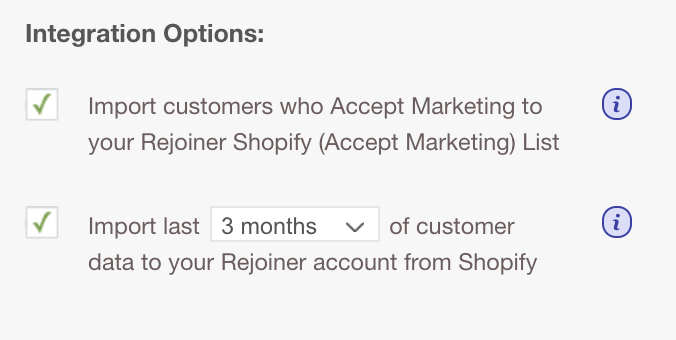 Simply use our Lists filters and select "Is Subscribed to" and your Shopify (Accepts Marketing) list to target customers who are part of that list. Can I skip importing this list? Yes, but we highly recommend you select this option while connecting Rejoiner to your store. Doing so will allow us to set up a native connection between your Accepts Marketing group and Rejoiner. We want you to use Rejoiner for all the lifecycle campaigns you can imagine right from the start. This means that Rejoiner needs to have customer data in order to send Post Purchase campaigns to customers who have completed orders prior to connecting Rejoiner to your store. Rejoiner facilitates this process during the connection process so all you have to do is select the Import customer data option as part of your Integration Options. You can then select how far do you want us to import data from your store to Rejoiner. 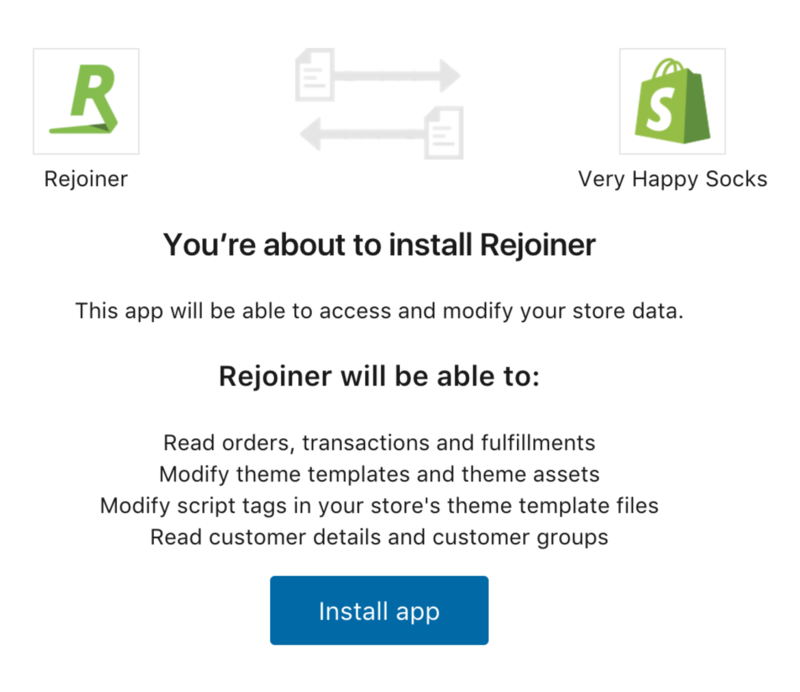 Now that your store is connected to Rejoiner you can begin sending powerful lifecycle campaigns! Let us know if you experience any issues while connecting Rejoiner to your store. We're happy to help.